(Manufactured & Delivered By Us). 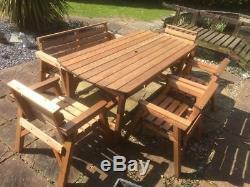 Solid Wood Garden Furniture Patio Set 6 FT Table + 1 Bench + 4 Chairs. THIS ITEM COMES FULLY ASSEMBLED WHICH ARE HANDMADE IN STOKE-ON-TRENT, STAFFORDSHIRE. Your Furniture Will Be Treated. First Treatment - Pre-coated with a Rustic Brown wood treatment base coat. Second Treatment - Will prevent Mould, Algae, Lichen & Moss. Third Treatment - Preserver, Locks in the First & Second Treatment. Which makes your garden furniture more waterproof. All our products are hand made to highest standard from the Finest quality Scandinavian Red wood. Please Note : Due to high demand for our products we will only deliver to. Welcome to Fenton Garden Furniture. The item "Heavy Duty Wooden Garden Patio Furniture 6 ft table 1 Bench and 4 Chairs" is in sale since Wednesday, April 8, 2015. This item is in the category "Garden & Patio\Garden & Patio Furniture\Garden & Patio Furniture Sets". The seller is "fenton-garden-furniture" and is located in Stoke-on-Trent. This item can be shipped to United Kingdom.